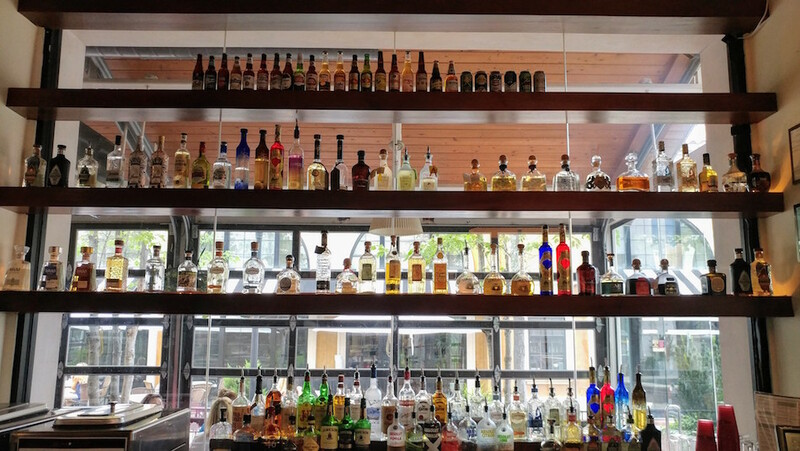 BRW2017: Cocina Superior Serves up Large Portions of Tasty Tex-Mex Food! 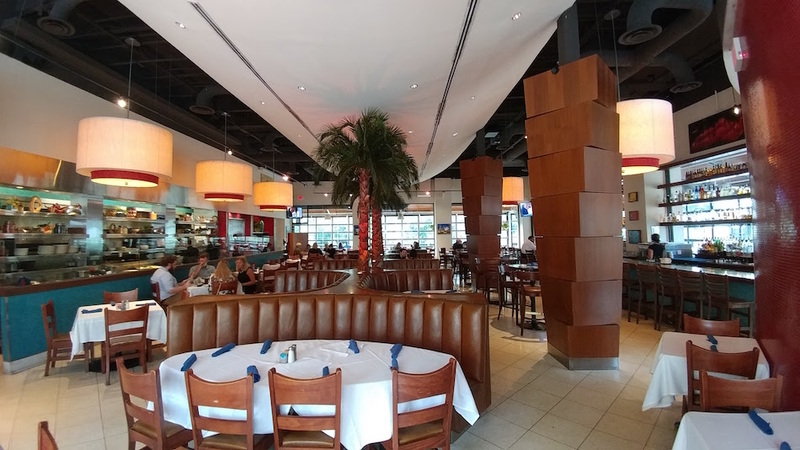 Cocina Superior Serves up Large Portions of Tasty Tex-Mex Food! 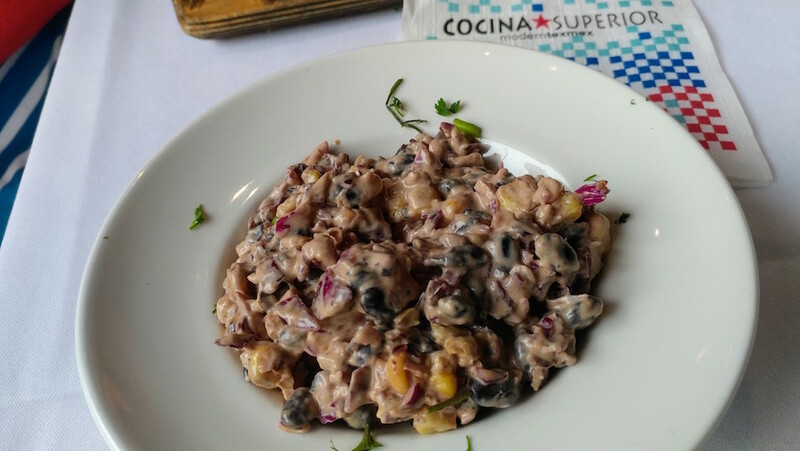 The Hearty Dishes at Cocina Superior don’t disappoint! 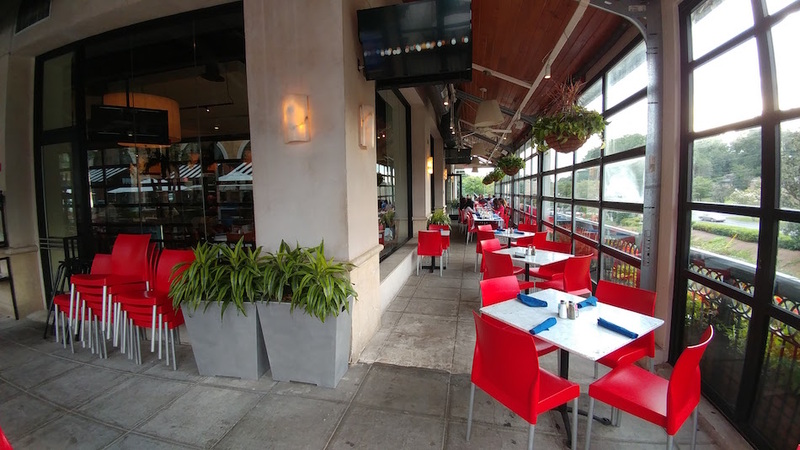 Almost 8yrs ago, I attended a friend’s birthday party at Cocina Superior. I looked across the long table and saw a cute girl who then asked me about the amazing dessert I had. She would later swear up and down that she wasn’t flirting, that she really just wanted a bite of my Bananas Foster. Fast-forward to present day. I’m sitting in the exact same spot at Cocina, looking at the same beautiful girl that ended up marrying me. 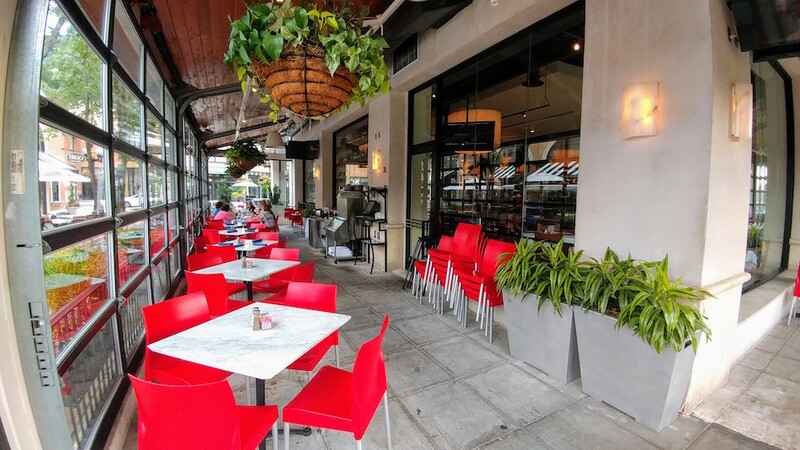 So forgive me if I’m a little bit biased towards the food at Cocina Superior. It may have been just what I needed to catch the attention of the perfect girl. Needless to say, Amber and I were pretty excited about heading back to Cocina Superior for Birmingham Restaurant Week. We arrived for an early dinner and I, for one, was hungry! This was good since the portions at Cocina haven’t gotten any smaller over the years. You are sure to have plenty to take home with you. Even the #BRW2017 portions are big! For a $30 price point it’s an incredible deal! 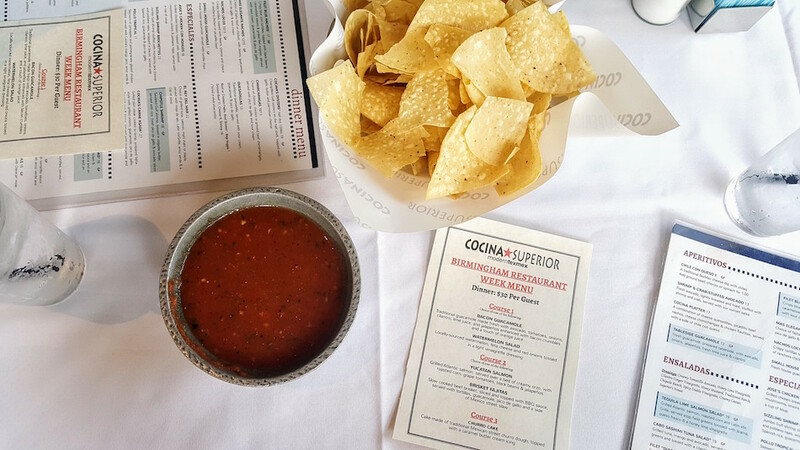 We began looking over the menu while enjoying their thin flour tortilla chips and fresh, flavorful, salsa. (Apologies in advance for any salsa stains in the photos. It’s all part of the experience.) 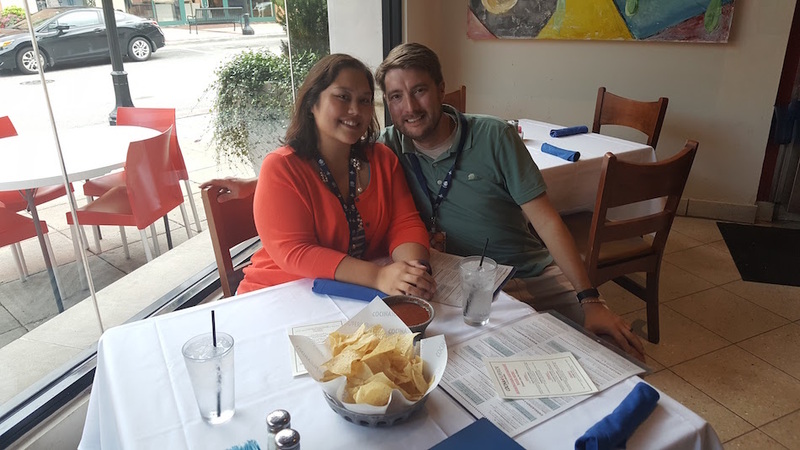 Since there were two of us, we were able to sample all the Restaurant Week items. 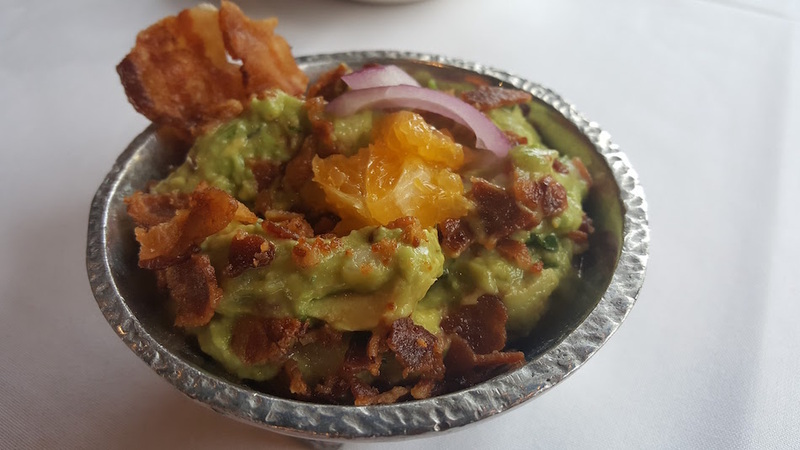 There’s guacamole and then there’s Cocina’s Bacon Guacamole! This Guac combines fresh onion, tomato, avocado, cilantro, lime juice, diced jalapenos, and (of course) bacon! Be warned that this is a spicy guacamole, but it is delicious. The bacon is super crispy and adds the perfect amount of flavor. You may want to ask for an extra basket of chips when this appetizer hits the table. In contrast to the spicy Bacon Guac, Cocina is serving up a refreshingly cool Watermelon Salad. 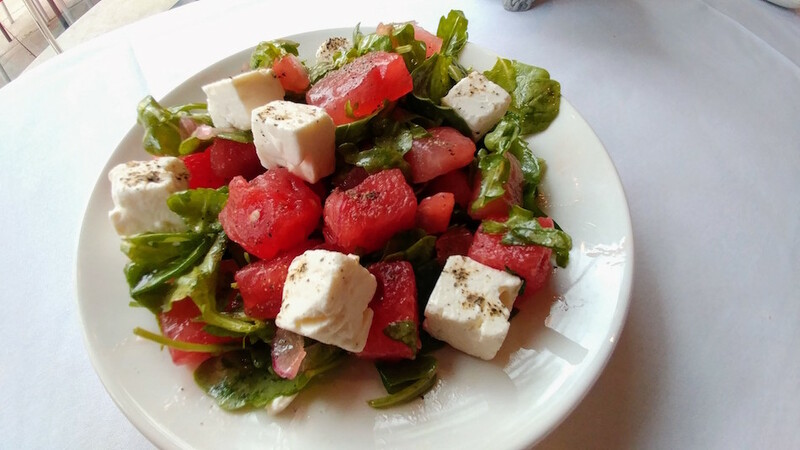 This is a great summer salad for a hot day and is topped with locally sourced watermelon, red onions, and feta cheese. All of this is tossed in a light vinaigrette dressing with just a pinch of pepper on top. The freshness of the watermelon makes this salad standout. Our first entree was the Yucatan Salmon. Some think that this dish is spicy, but I thought it was just right. 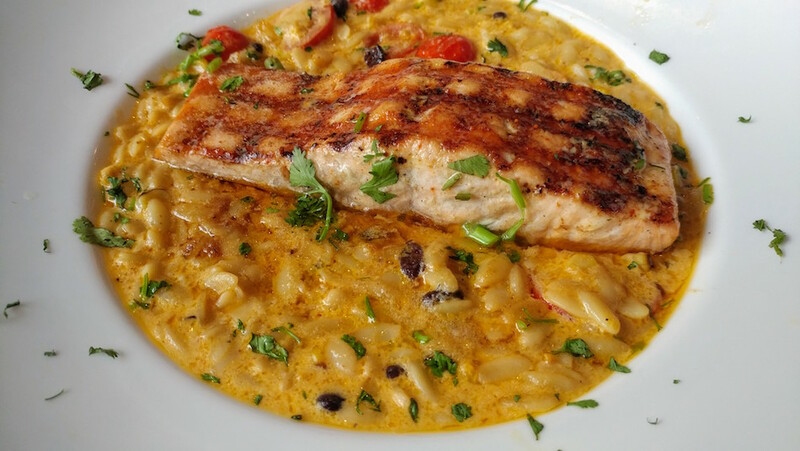 The Atlantic Grilled Salmon is so flavorful and flaky and is served on a bed of creamy orzo. The orzo includes grape tomatoes, roasted corn, black beans, and jalapenos. It has an Étouffée taste and consistency. Every bite was incredible and the flavors blended perfectly! Yes, the side dish gets extra love here. The Mexico Street Slaw is a cool, creamy, helping of roasted corn, black beans, onions, and what has to be some other magical ingredient that I have yet to identify. Long story short, you should definitely try it! After our meal, Amber and I were talking about what we ate and comparing notes. She proceeded to say this, verbatim, “If people do ONE thing for Restaurant Week they should go and try that Churro Cake!” I’m going to be honest and admit that I wasn’t paying much attention to the menu, so I thought we were getting churros. Sure they’d be dressed up, but they’d be churros, right? Nope! The Churro Cake is a cake made of traditional Mexican street churro dough! As if that weren’t enough, it’s topped with caramel buttercream icing! CARAMEL BUTTERCREAM!!! (Sorry, I got excited.) It’s like a churro had a baby with a tres leches cake. 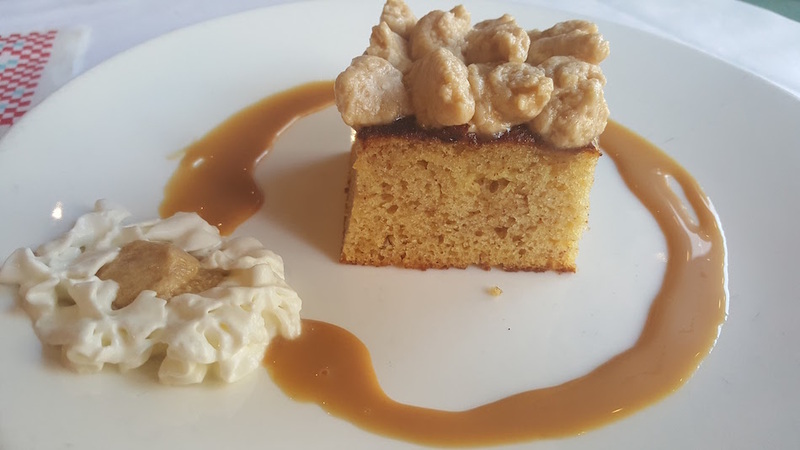 If you decide to share a bite with someone unfortunate enough not to have ordered their own, be prepared to defend your plate for the rest of dessert. As the meal came to a close, we ended up with a massive to-go bag. 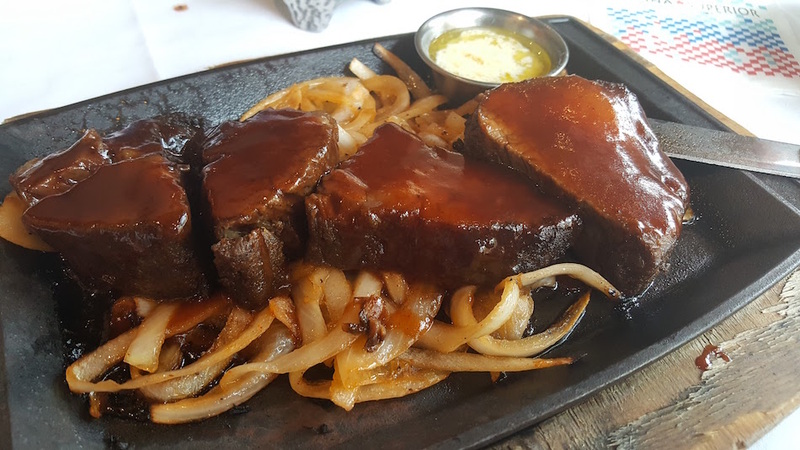 Our experience was nothing short of stellar and our server, Ozzy, was fantastic! 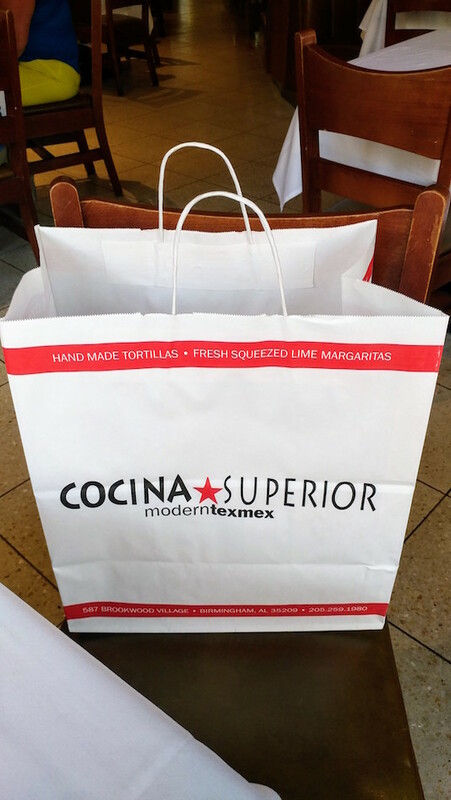 Whether you are going for a weekday lunch, Friday margaritas on the spacious patio, or an evening dinner, you are bound to be impressed by what Cocina Superior has to offer. Oh, and if someone invites you to a birthday party there, don’t skip out. You might just miss out on meeting “the one.” Trust me.